Welcome to LAF - the Lyttelton Arts Factory - performing arts education programme. Why the Lyttelton Arts Factory? A factory creates stuff. We want to create performance. We do not want to separate the arts but integrate them into all elements of performance. LAF is a space where theatre, dance, music and circus can all happen. Our performance education programme strives to develop skills in the areas of acting, voice, music & movement and apply these skills in projects and productions throughout the year. LAF offers you the opportunity to study in a professional theatre environment with the critically acclaimed practitioners Director Mike Friend and Musician Carmel Courtney. At its core, Lyttelton Arts Factory is a practical expression of Mike Friend's belief that the arts should not be separated, and that theatre and the arts are for the many not the few. Lyttelton Arts Factory (LAF) is offering theatre/performance classes for all ages every Monday and Wednesday. The purpose of these vocational workshops is to teach the students to perform in a fully equipped professional theatre, culminating in an end of year show at Lyttelton Arts Factory. The Junior to Advance classes have their shows ticketed, promoted and open to the public. All students will perform with lights, sound and set design. 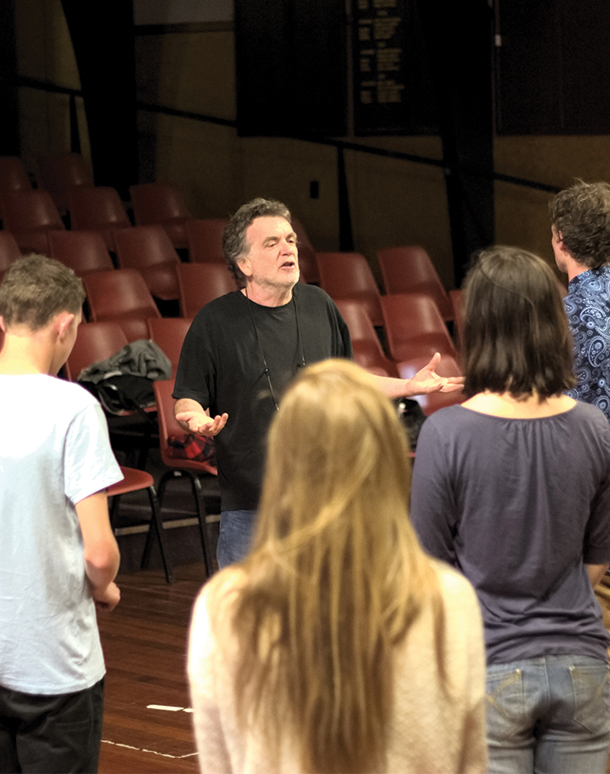 This is a unique opportunity to be taught under the professional direction of Mike Friend in the art of performance in a fully equipped professional theatre with exposure to some of New Zealand’s top performers and teachers. LAF's Artistic Director, Mike Friend, has worked in theatre performance and education all his life. After completing a BA Hons in Performing Arts in the UK, Mike continuerd his training at London University with a postgraduate teaching qualification specialising in dance and drama. Mike founded and was Director of Performing Arts at Hurtwood Theatre in the UK in 1987, and continued throughout this period to work on shows in London's West End and for the Edinburgh Festival as a professional director. He has further directed shows in Ireland, Australia, Thailand, Croatia and the Philippines. He settled in Lyttelton in 2004 and founded The Loons as a performance venue and The Loons Circus Theatre Company. Following the loss of The Loons, Mike set up the Lyttelton Arts Factory. Students will learn about different styles of music and different instruments and how to play in ensembles and bands. This is a unique opportunity to be taught musicianship and performance skills in a professional venue. Students will also perform in an end-of-year production. Carmel is a multi-instrumentalist, vocalist and composer. She taught Contemporary Music at MAINZ in Auckland for three years and at 'Polynesian Performing Arts' in Christchurch for two years. Carmel collaborates with musicians in a wide range of styles and has toured extensively playing festivals around the globe. She heads up 'Toot Toot Sounds', a body which provides music education within schools and works closely with the Lyttelton Arts Factory on productions. BEGINNER musicians. Ekplore instruments and the basics of working together in a group dynamic. FOR INTERMEDIATE musicians. Improve instrument and performance skills while working in a group dynamic with an emphasis on building repertoire and composition. FOR INTERMEDIATE & ADVANCED musicians. Improve instrument and performance skills while working in a group dynamic with an emphasis on building repertoire and composition. We are excited to offer you hip hop classes with our exciting new tutor Halle. The purpose of these classes is to provide dance skills while at the same time developing social, teamwork and leadership skills. Students have the opportunity to form dance crews and perform with full lighting and sound at LAF events during the year.